[image source_type=”attachment_id” source_value=”1618″ align=”right” size=”medium” autoHeight=”true”]Making homemade French Bread is not as scary as it sounds. There are very few ingredients (5) and no thermometer is required for getting the water temp ‘just right’. Homemade is also best because you can control what ingredients go into the bread. This recipe has no dairy, no nut, and no sugar required. You can also use whatever flour you choose, keeping in mind that some wheat flours run just a bit dry. Making homemade bread is a huge money saving tactic for our family, because of how much bread we consume and the grocery prices up here in Alaska. In a mixing bowl (I use the stand mixer) place the 2 cups flour, dashes salt, and the yeast to begin blending. This can be done on a low setting to avoid flour flying messes. Turn on the tap water to hot and wait till it’s very warm but not steaming. Get 2 cups of this very warm water and slowly pour it into the flour mixture while the paddle is still moving as a slow setting. 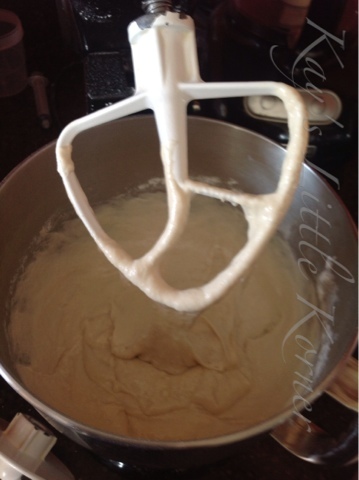 Once the water has integrated, turn the mixer to medium and let it blend for 3 minutes or all the lumps have disappeared. Add another cup of flour and let the paddle work this in. French bread like to be roughed up a bit more than other bread doughs. I let the dough hook work it for a good 3 minutes at this point. This first dough ball needs to rise about 1 hour. The first rise time depends on the temperature of the room. Cool rooms require longer rise times, warmer rooms may be less. The first rise will make the dough ball double in size and THAT is what you are looking for. After the dough has doubled in size, I dump it onto a lightly greased baking sheet, pinch the dough in half, and then gently roll the dough half into a snake type shape. This greased surface helps for the rolling dough to stick to itself and remain ‘moist’ to assist with the second rise. The dough should look like this when you are finished with your rolling. For proper French Bread, you will want to score the bread a few times in a diagonal manner. These shaped and cut loaves will need to rise a second time to double their size again. Dough has risen and is doubled in size. Punch it down and scoop it out onto a floured surface for forming. Split the dough into 2 even portions. If you use cooking spray on the baking sheet, it will also keep the dough moist as you form the dough. 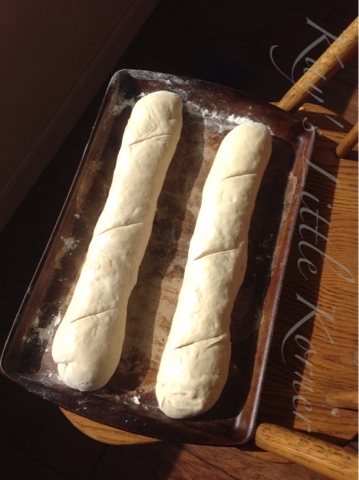 Roll the dough jelly style and form into the shape you desire for your French bread loaf. For good, crusty French bread, you will whip the egg white and water to brush onto the exterior of the bread just before placing it in the oven. If you plan to make this break into garlic bread (or anything with a second bake time) you may want to omit this step. The bread will head into a preheated 375* oven for about 26 minutes. Watch your crust for the desired look.